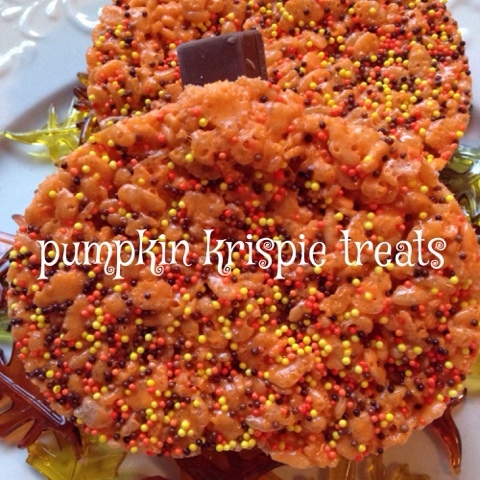 Pumpkin Krispie Treats are fast, easy, affordable and delicious. Everyone loves rice krispie treats and these treats have a special ingredient added to the melted marshmallow mixture, dry instant pumpkin spice pudding and pie mix. 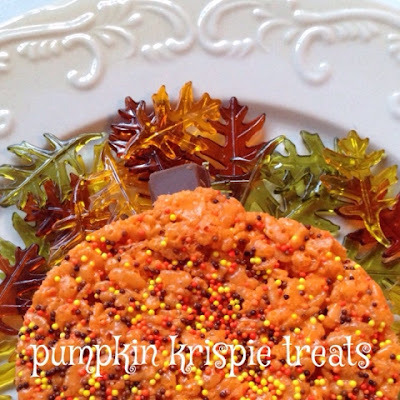 We then tinted the marshmallow mixture a bright orange and folded in 1/4 cup Autumn blend sprinkles. After the treats have set up for a few hours, call the kids into the kitchen and have them cut out shapes with a pumpkin cookie cutter. The stem end of the pumpkins are a mini kit kat. 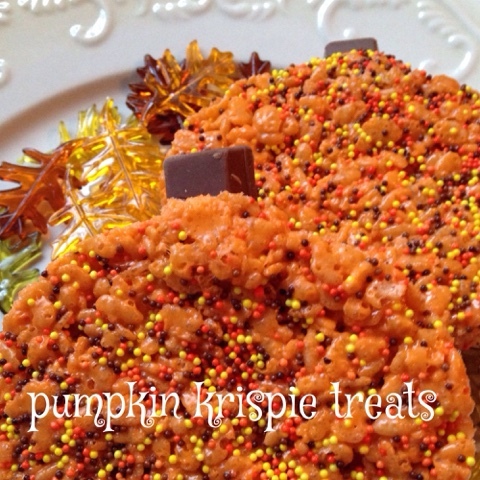 Pumpkin Krispie treats won’t last long, so make a big batch! Lightly butter 13 x 9 inch baking pan. Set aside. Melt butter in a large saucepan, add marshmallows, stir until melted. 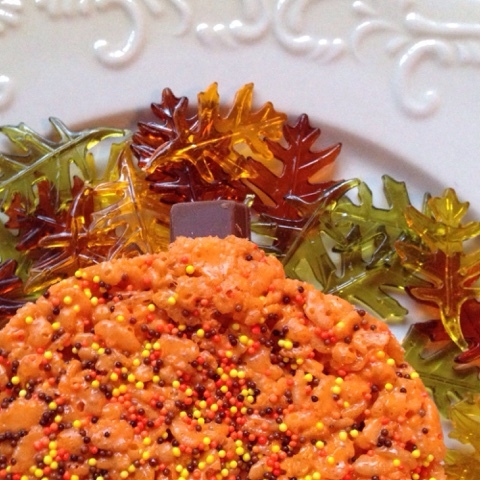 Remove from heat; stir in a few drops of orange food coloring and dry instant pumpkin spice pudding and pie mix; stir in rice krispie cereal and 1/4 cup autumn sprinkles. Stir until well coated. With the back of a buttered spatula, spread marshmallow/cereal mixture into prepared baking dish. Sprinkle the top of the krispie treats with the remaining 4 tablespoons autumn blend sprinkles, lightly pressing down. Set aside for 2 hours. Cut out as many rice krispie treats as possible using pumpkin shaped cookie cutter. If your cookie cutter has a stem end, cut stem end off using a knife. Place one half kit kat mini candy bar in the top of krispie pumpkin treat for stem. Oh boy do those look fattening and too luscious. Printer is out of ink but saving this one. Looks like lots of ingredients but will hopefully stock up so can make them.These would be good to give for treats for Halloween. Do you get lots of trick or treaters? We have never had one in 10 yrs. we've lived out here.